I just exchanged gifts with my in-laws for Christmas. I sort of know what I’ll get every year. It usually varies from clothing to gift cards and money which is tremendous since this is usually the only time of the year when I’ll have a good amount of money to spend on something. So we were exchanging gifts and my sister-in-law, Vangie, gives me an envelope, which contained money. The she pulls out a black bag from the side and she gives it to me. She tells me that she was at a garage sale when she saw this item and thought about getting it for me. Somebody asked, “Is it a computer?” It certainly looked about the same size. I opened it up and pulled out a wooden box from the bag. The wooden box has an easel that can be propped up. Vangie tells me that there is a drawer that could be pulled out. We had a little difficulty finding the latches at first but eventually found it and got it to open. As the drawer slid open, my eyes lit up. Inside was a virtually unused set of drawing pencils (graphite, charcoal, and pastel), erasers, sharpeners, charcoal and graphite sticks, blending stump, and vine charcoal. About 3 or 4 of the pencils have been used but everything else was virtually new. 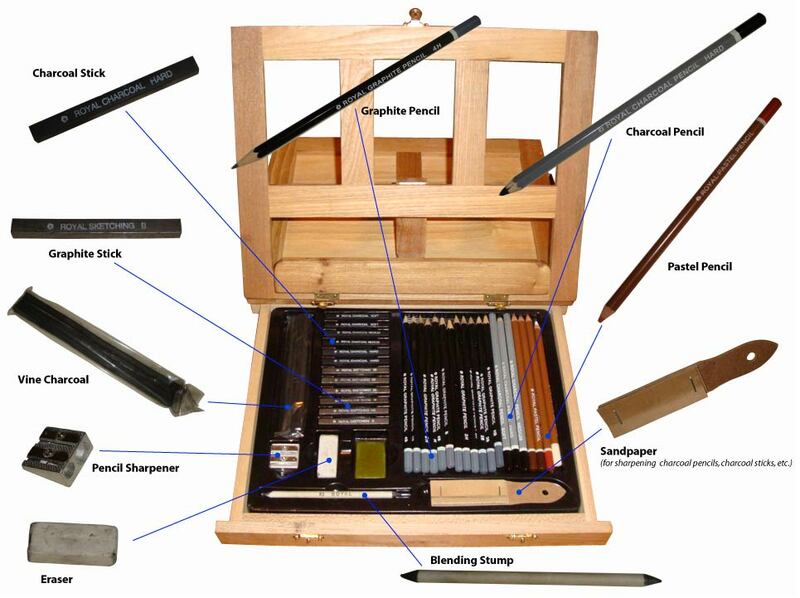 As an artist who uses these tools, I was given a gold mine. I can’t thank Vangie enough for gifting me with these artist’s tools. Here are some new charcoal figures and portraits that were done recently. The one on the left was a 20 minute pose and the one on the right was for 40 minutes. Both drawings below were 20 minute poses. I really like the pose on the right and I just may do an oil painting off of it.